Although we are located in Raleigh, we cover the whole Research Triangle area. Other areas we serve include large surrounding areas from Apex, Cary, Garner and more. If there’s a plumbing problem in your home, we’ll fix it. 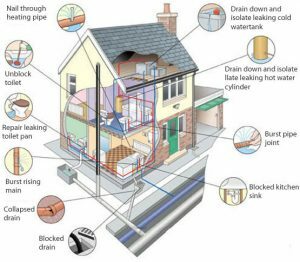 There’s a long list of things that can go wrong in any home—leaky toilets, water heaters that don’t work, clogged pipes, sewer problems, low water pressure. We’ve seen just about everything and know how to fix it all. Few things are more frustrating than leaking pipes, clogged plumbing or broken water lines. At Unlimited Plumbing, we take care of all your various plumbing and water problems so that your house continues to run smoothly year round. The average homeowner typically makes several trips to the hardware store before they have purchased all the right parts. Only to find that the tool they need to do the job is quite expensive. The fact is that many homeowners think they can save time and money doing their own plumbing repair jobs. What they find in the long run is that they save neither, and in many cases end up spending much more than they thought they were going to save with no good results to show for it. At Unlimited Plumbing we understand your concerns about cost, and time. We want you to know we are here to resolve the problem as quickly as possible and at a cost that won’t break the bank. Whatever your plumbing needs are from simple repair replacement jobs up to technical diagnosing and the installing new technology products such as tankless water heaters, Unlimited Plumbing is the company that can get it done for you. Call the best Raleigh plumbers any time day or night, from any surrounding city. Whether you need a rooter, a sink unclogged, a toilet fixed or a pipe repair, we have the tools, expertise and professionalism to take care of every pipe, sewage and plumbing problem that could come up. Perhaps you’re having heating and cooling issues? Or you’re in need of waste removal. Some houses and office buildings need plumbing service for potable water delivery. We know everything about everything when it comes to valves, tanks, pipes, plumbing fixtures, and anything that conveys fluids throughout your home, parts of your home, apartment building, office building or factory. If it has to do with fluids, count us in!!! Hence, we work with all kinds of people in the plumbing trade, and only associate ourselves with the very best. Need a boilermaker? Few do, but when they do, we’ll get you to the right person. How about a pipefitter? We associate with our longtime pipefitter company, because they do such fine work and we must call upon them time and time again. Today instead of lead pipes (in ancient Rome) or iron pipes (in America until 1960) we have extensive knowledge and experience with copper tubing. Of course, we can also do anything with galvanized steel or plastic pipe, too, including sealants, fittings and fixtures. But don’t think our experience stops there… we also work with water filters, water softeners, heat exchangers, water heaters (even solar ones), pumps, meters, backflow prevention, gauges, expansion tanks, UV sterilization lights, and more. And of course, our equipment is top of the line… soldering torches, pipe wrenches, vises, cutters, flaring pliers, bending machines, crimp tools, video cameras, hydro jets, hydraulic pumps, steel cables… you name it. Even plumber’s putty (fun stuff) and pipe dope. I hope we’ve given you food for thought on who might be the best plumbers in Raleigh, North Carolina, or at least who you’d like to call to get a free quote on your plumbing needs.